Fruits of hazelnut big, or Lombard nut. The fruit (nut) is surrounded by a long Cupule. The core is 25-63% of the mass of walnut. 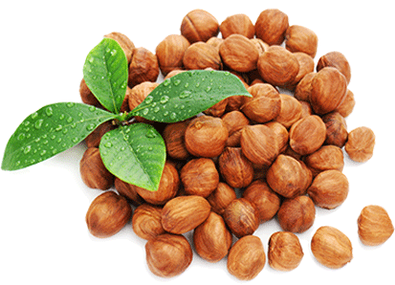 Hazelnut used in food, confectionery industry and to obtain an oil. 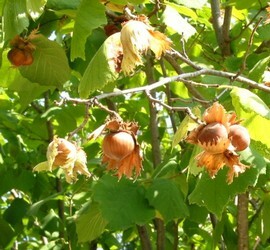 The main producers of hazelnuts - Mediterranean countries. The plant is up to 10 m tall with gray branches, densely glandular-pubescent annual shoots. The leaves are round or broadly, 12 x 10 cm, with a heart-shaped base, with a sharp, short top, bottom-pubescent along the veins on the edge of the double-toothed, with myagkoopushёnnymi petioles, lanceolate stipules. Fruits crowded. Wrapping walnut, 2 times its length, tubular, pubescent, with large teeth at the end. Yellow-brown nuts are almost spherical shape, the length of 15-25 mm and a width of 12-20 mm. Hazelnut is the source of energy for humans - 100 g hazelnuts contains 639 calories and a high percentage of protein, 16 to 19%. The hazelnut kernels contain 60 + 5% oil, consisting of glycerides, oleic, palmitic and stearic acids, which inhibit the growth of blood cholesterol, protect against disease, and are essential for the growing organism. Therefore, hazelnuts should be an integral part of the nutritional status of children, young people, especially the elderly. The high content of potassium, calcium, combined with tsinkm promotes effective development and strengthening of structure of bones and prevents high blood pressure. They are allowed to eat even diabetics. Because of the extremely low-carb nuts can be taken even with a very strict diet and did not recover. 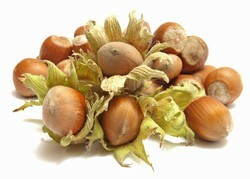 Hazelnuts contain substances that remove toxins from the body (especially the liver). It prevents putrefaction, contributing to cleansing the body and strengthens the immune system.